Aid to unfortunate people is at the top of very few lists of things people think a lot about. According to the U.N., around 125 million people in the world today are in need of some form of humanitarian assistance. The number of people dying in wars has risen dramatically during the past few years. More people have been forced to flee their homes than at any other time since World War II. The calamitous 5-year-old Syrian conflict is one of the major causes of the situation. Last year, the budget of the International Committee of the Red Cross was at a record 1.6 billion Swiss francs ($1.58 billion). This year, it will rise again to 1.7 billion. This figure is 50 percent more than it was five years ago. But while global generosity has never been higher, needs are still outstripping means to respond. Energize funders by making them stakeholders. Or, to say this in our words and not his, try to get the people who provide the aid to see themselves as involved in the outcomes. Logical consequence: if those outcomes turn out to not be there (what's called in business terms zero return on investment), the people providing the money are likely to stop giving. Or alternatively they may get involved in trying to change from outside what's done with their generosity so that it becomes (more) effective. European Union funding: Its availability has evolved into one of the most effective ways for the Palestinian Arab elite to (a) make obscene personal fortunes for themselves and their children; and (b) fund terrorism among the people they rule. UNRWA, the bizarre refugee organization that does all it can to ensure the poor and homeless of one very specific sub-set of Arabs remain poor and homeless and has been doing so for seven decades. What can money do? Quite a lot provided people's expectations are carefully managed, and there's competent and responsible leadership involved in its oversight, distribution and application. Which brings us to the Palestinian Arabs, where money has been poured and poured and poured for decades. What it has achieved and failed to achieve is poorly understood but vitally important. An article in a major business newspaper yesterday looks at this vexed set of interlocking issues and comes up with what ought to - but will not - be startling revelations. We're referring to "Where Does All That Aid for Palestinians Go? ", authored by a doctoral student in the law faculty at Tel Aviv University, Tzipi Hotovely. She's also Deputy Minister of Foreign Affairs in the current Israeli government. "...if it is spent to foster tolerance and coexistence. If it is used to strengthen intransigence it does more harm than good—and the more aid that comes in, the worse the outcome. This is exactly what has been transpiring over the past few decades. Large amounts of foreign aid to the Palestinians are spent to support terrorists and deepen hostility." Between 1993 (when the Oslo Process began) and 2013, the Palestinians received $21.7 billion in development assistance, according to the World Bank. [T]he disproportionate share of development assistance the Palestinians receive... comes at the expense of needy populations elsewhere. According to a report last year by Global Humanitarian Assistance, in 2013 the Palestinians received $793 million in international aid, second only to Syria. This amounts to $176 for each Palestinian, by far the highest per capita assistance in the world. Syria, where more than 250,000 people have been killed and 6.5 million refugees displaced since 2011, received only $106 per capita. A closer look at the remaining eight countries in the top 10 [aid recipient nations]... Sudan, South Sudan, Jordan, Lebanon, Somalia, Ethiopia, Afghanistan and the Democratic Republic of Congo [reveals] that these countries have a combined population of 284 million and an average per capita GDP of $2,376. Yet they received an average of $15.30 per capita in development assistance in 2013. The Palestinians, by comparison, with a population of 4.5 million, have a per capita GDP of $4,900. [T]hough the Palestinians are more than twice as wealthy on average than these eight countries, they receive more than 11 times as much foreign aid per person. The Democratic Republic of Congo is a case in point: Its 79 million people have a per capita GDP of $700, yet they receive only $5.70 in aid per person. The Palestinian leadership has had ample opportunity to use these funds for economic and social development. Tragically, as seen in Hamas-run Gaza, it prefers to use the funds on its terrorist infrastructure and weaponry, such as cross-border attack tunnels and the thousands of missiles that have rained down in recent years on Israel. Aside from funding terrorists and investing in hate speech, the PA stubbornly refuses to remove hundreds of thousands of Palestinians from “refugee” rosters, deliberately keeping them in a state of dependence and underdevelopment for no purpose other than to stoke animosity toward Israel. The [Mahmoud Abbas] regime in Ramallah pays monthly stipends of between $400 and $3,500 to terrorists and their families, the latter of which is more than five times the average monthly salary of a Palestinian worker... Overall in 2012 foreign aid made up about a quarter of the PA’s $3.1 billion budget... [T]he PA’s annual budget for supporting Palestinian terrorists [in 2014]... amounted to some 16% of the foreign donations the PA received annually... More recent figures are inaccessible since the Palestinian Authority is no longer transparent about the stipend transfers. ...Palestinian Prime Minister Rami Hamdallah made assurances as recently as September 2015 that the PA will provide the “necessary assistance” to ensure these terror stipends [keep coming]. Embarrassed by public revelations of the misuse of the foreign aid, in August 2014 the Palestinian Authority passed the task of paying stipends to terrorists and their families to a fund managed by the Palestine Liberation Organization, also led by Mr. Abbas... This procedural ruse apparently calmed the consciences of donor governments that continue to transfer aid. It is difficult to think of another case in which such a forgiving attitude would be taken regarding foreign aid to an entity that sponsors terror. We addressed the matter of the PA's "procedural ruse" in a post published here some seven months ago: "02-Jun-15: The obvious, petty lies that keep European money flowing into the hands of the PA's terrorists". In it, we referred to original research by the indispensable Palestinian Media Watch showing that in August 2014 the Mahmoud Abbas-dominated PA announced the closing of its Ministry of Prisoners Affairs, the agency which for years funneled monthly salaries to terrorists. Evidently under pressure from Western donors, the Abbas regime overnight created a replacement for the PA ministry: a brand-spanking new PLO Commission of Prisoners Affairs – independent (wink wink nod nod) of the PA and set up to pay those very same salaries to the same people and for the same sickening reasons. That new PLO entity is of course new in name only. It has the very same mission and responsibilities and pays exactly the same amounts of salaries to terrorists/prisoners. 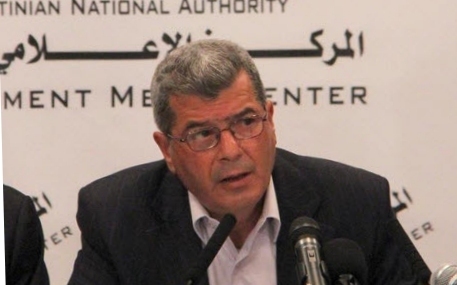 The PA minister of prisoners affairs, Issa Karake, overnight changed hats to become its director. PA/PLO/Fatah chief Mahmoud Abbas retains, as he did up until that moment it took over, "overall supervision of the PLO Commission". The minister in question, Issa Karake, whose hate-filled, terrorism-encouraging utterances we have quoted in this blog numerous times, is central to this flim-flammery. Used to be minister for prisoners; now he's not; instead he's commissioner for some PLO business unit which is a completely different and perfectly legitimate thing. The European suckers will swallow it without a problem because it's what they need from us. And so on. This vexed issue of foreign taxpayers delivering up unspeakably large amounts of money to politicians prepared to lie right into the faces of the donors is a key factor in the enduring nature of terrorist savagery, Palestinian Arab style. There's zero basis to expect an outpouring of tolerance or non-violence from any Palestinian Arab sources any time soon. Certainly not so long as Abbas and his wealthy cronies keep ruling the roost. And even more certainly while they keep educating their children in the values of bigotry, hatred and self-destruction.